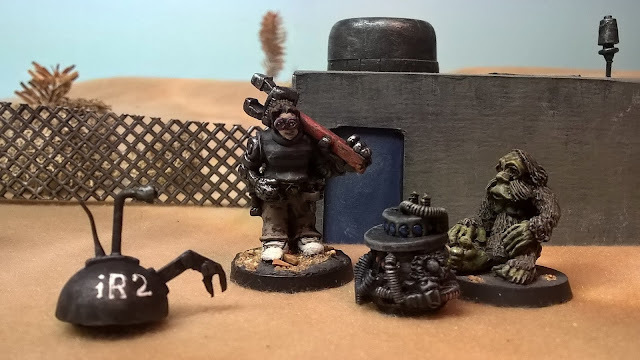 The miniatures below are from yet another Kickstarter, but unlike some of the others most or all are actually available and in regular production. They're from a company called Blind Beggar Miniatures. I'll say right here that these won't be for everyone, but if you're a little tolerant and enjoy a miniature that's got just a bit of the "blank canvas" to it, these are for you. First let me start with the "specforce ranger." I suspect he's probably another take on Lawrence of Arabia, rather like the Imp Guard Scout from a couple of posts back. But where I ran with that a little more on the last Lawrence, I tried to treat the current fellow more as a young Faisal of Arabia, which is to say more authentically local. (And less Dune. No blue washes on the eyes this time.) The scarf, which I again take to be a kind of khefiya, I gave somewhat more traditional colors. (Which is to say black and white.) Such things really do benefit from some kind of pattern, particularly since I now have several and I think blank colors would look cartoonish fast. Next up is a pack labeled The Bounty Hunters. 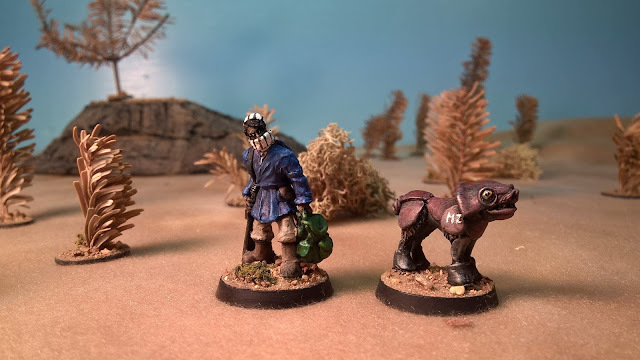 I actually prefer to think of them as nomads, and I painted the short one as a young child. (With a whimsical flower to kidsify her sand-mask. Yeah, she's got a gun and all, but . . . kids can be kids.) 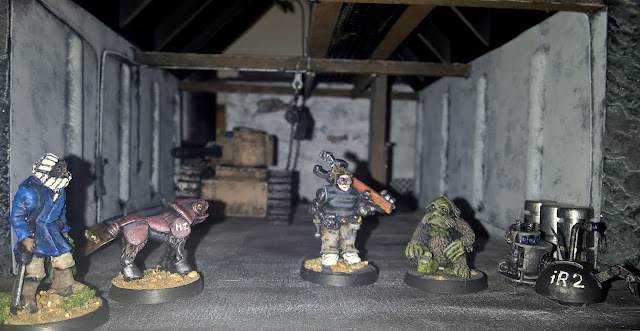 Apart from that small bit of freehand I suspect this was a fairly obvious paint job and it's quite a lot closer to what's on Blind Beggar's website than most of what I've done. But painting off white robes is actually a lot of fun. There's so much room for variation and subtle shading there. Besides, the three of them make a great family. Have you noticed that every second Western seems to have at least one fellow with a Cockney accent? Yeah, this is that character. And where there is a bowler there should be pinstripes. 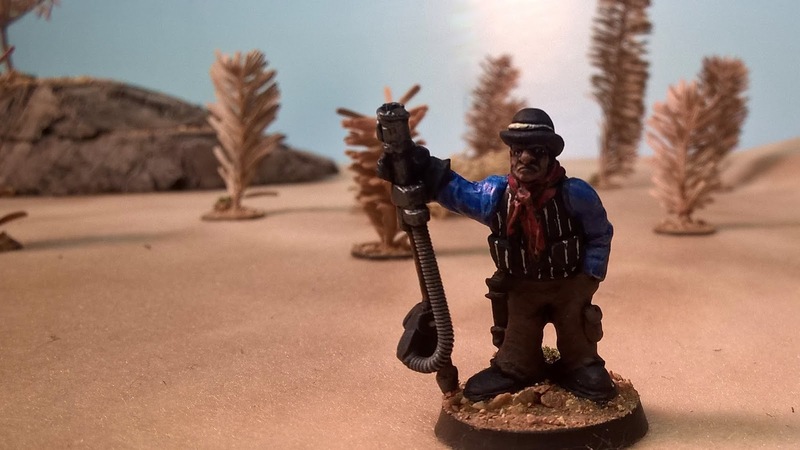 Again, a little freehand makes nearly any model pop just a bit more, and it is REALLY hard to argue with a pinstripe vest in the middle of a dusty frontier setting. Officially he's the manhunter, but I prefer to think of him as a grox herder or some such. Get away from the smog of New London and enjoy the smell of fresh air and grox leavings. The next set is labeled as The Mechanics: Joe, Kaero, and BOB 2. (I assume BOB 2 stands for Bits of [Busted] Bot or something like.) Joe and Kaero seem a clear enough reference. The lady with the oversize wrench got some freehand to spice her up a bit. The striped blouse is fairly obvious, but I think the camouflage pants in the same pattern as the First Logansport might almost slip past. (Perhaps she mustered out at some point not too long ago. Or maybe she just shops military surplus for work pants. Either way, it can be a subtle connection to her surroundings.) The Sapiens non-homo got a fairly simple orangutan inspired treatment. The busted bot is heavily weathered, but otherwise pretty simple. 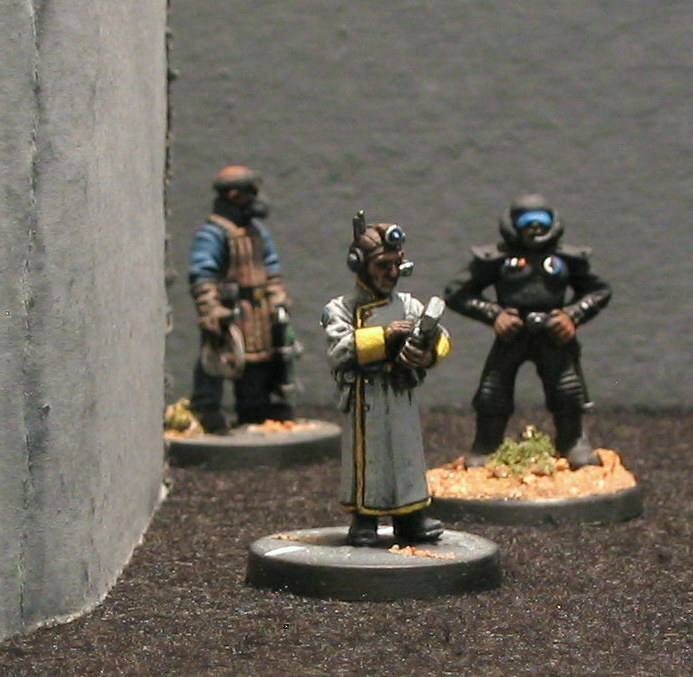 iR2 is from a separate line of miniatures, but I like him and got him painted fairly quickly anyway. I rather broke some rules with the next few. 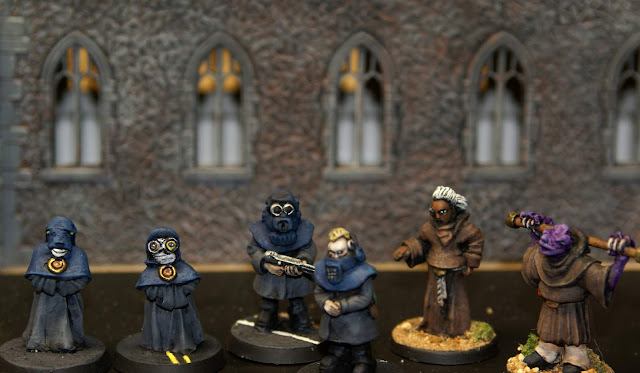 They come from a few different sets respectively called the Priest and Acolytes, Baronial Guard Characters, and an alien monk fellow that was, I fear, a kickstarter exclusive. I believe the guards were originally marketed as a customs inspector and his guard. Moab III already has a spaceport official with a rather different look . . .
. . . But he quite reminded me of the Colony 87 pilgrim (seen below in grey) . . . So the acolytes gained a new preacher, but otherwise remained much the same. (And I think their habits look much more akin to the tech collars of the Baronial forces anyway.) The priest became a monk, if a somewhat angry looking one. And the alien monk became the friendlier alternative. 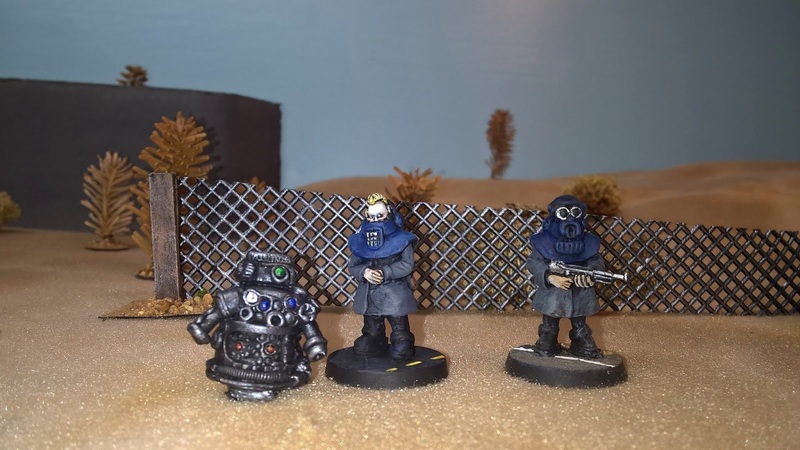 I still have a few miniatures to go in the set: most notably the mayor, his wife, and a bunch of small animal robots, but all told I'm fairly please with them. 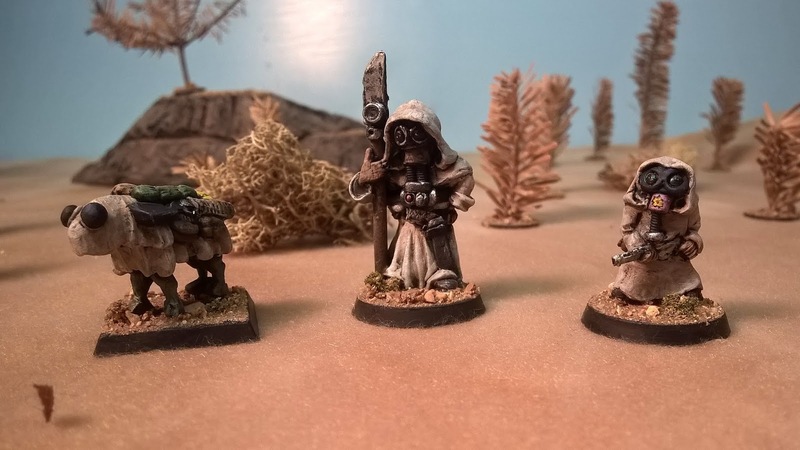 Many of them benefit from some judicious freehand, as there are large fairly plain stretches of cloak or shirt to paint. The sculpting is fairly simple, at times maybe even just a touch crude, but that actually works well for the environment I have in mind. And with paint? I'm really quite pleased with what they add. All told, these have been fun. They're probably not for everyone, but if you want civilians for a Space Western you could really do quite a lot worse. These folks will add some bustle to any half-forgotten settlement on the edge of flea infested nothing. As always, thank you for reading along. 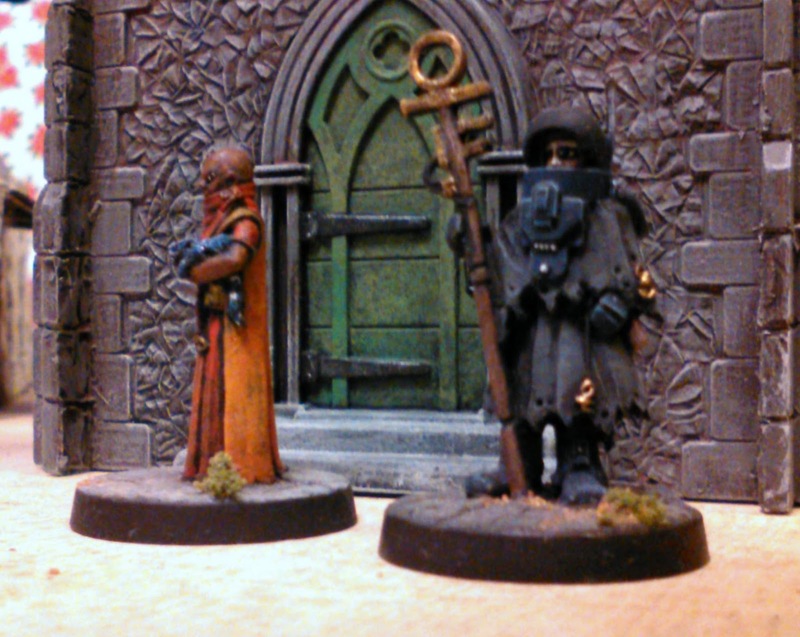 I got one of the kickstarters for blind beggar. I agree, they aren't for everyone...a lot of their offerings I don't really like but there was one (the outlanders) that hooked me in. I should get to painting some of them. The dogs definitely pulled me in and are very characterful. The 'church' in your backgrounds has a very distinct texture/pattern. Where is it from? The church is an old Bachmann Plasticville kit. I don't see that particular model on Bachmann's site right now. (They seem to have a different church going.) But you can find them often enough on the bay. Plasticville is actually not a bad source for reasonably priced buildings, though none have interiors, so they have their downsides as well. I have several that I inherited, so the price was right. I deleted the clapboard steeple to make it more adaptable. Honestly, without the steeple it almost looks like a small English village church to my eye. I look forward to seeing what you do with the Outlanders. I . . . thought hard about that one, but didn't quite bite. But Me and My Shadow had just the mix of crazy I like. Adaptable. Colorful. Story-making. And all quite different.